GERMANY in central northern Europe has a population of about 83 millions people (03/2007), stretches on 357,000 km and is the third largest economy in the world. About 3.4% of the populations, 2.8 millions people, are Muslims. The prominent group of Muslims in GERMANY is from Turkish descent. They or they parents came to GERMANY in the 60’s and the 70’s as, so called, “Guest Workers” to participate in the economical prosperity. Many of them were born in GERMANY. They came from a moderate Muslim state of Turkey with the secular legacy of Ataturk. 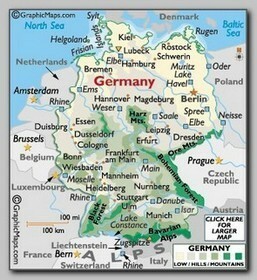 GERMANY therefore suffers less than France, Italy or UK from a large, segregated, Muslim community. The main problem of GERMANY, currently, is the very low birth rate and a larger number of older people which force GERMANY to accept large numbers of immigrants in order to sustain the economical growth. GERMANY is a Democracy since 1949 and the leading member in the European Union and has a very liberal and tolerant approach to all immigrants. Today (03/2007) German forces are fighting the Global Jihad as part of all European NATO expedition force in Afghanistan but is not involved in the war in Iraq.